Sometimes leaps forward in automotive technology come from unexpected directions. In October 1967 the rather niche German manufacturer NSU was the one to shock people with the launch of the radical Ro80 saloon. In the post-year wars, NSU had followed other European manufacturers in making small family cars before branching out into sports cars, including the NSU Spider which was the world’s first production car powered by a Wankel rotary engine. The Spider was a conventional-looking two-seater though, and it didn’t even hint as to what was to come. When launched, the Ro80 was quite unlike anything else on the market. Like the Spider, it came wth a Wankel rotary engine, in this case capable of producing 115 PS in a car weighing less than 1300 kg. But that was hidden beneath the remarkable exterior, which is what grabbed everyone’s attention. The wedge-shaped design gave the Ro80 very slippery aerodynamics, and the huge glasshouse on top gave excellent visibility. It also featured front-wheel drive, an automatic clutch, all-round independent suspension and all-round disc brakes, with rack and pinion power steering. In terms of features, the Ro80 was very much ahead of its time. 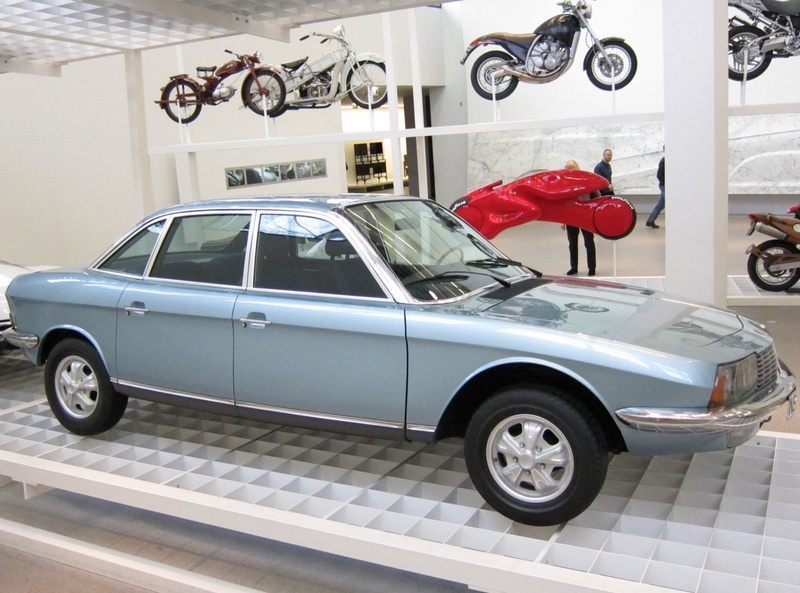 The heart of the car was the Wankel rotary engine – it was very smooth, compact and light which reduced the overall weight of the car and allowed a more aerodynamic design. But it was also hugely unreliable with critical design flaws… and those flaws killed off NSU. NSU had worked with Mazda to develop rotary engines for cars, but where NSU had poorly designed apex seals Mazda did not. Mazda went on to produce a range of reliable Wankel-powered cars up to 2012, ending with the Mazda RX8. NSU on the other hand went bankrupt and was bought up by Volkswagen who folded NSU into their new Audi brand. Later “Audi” Ro80s were more reliable, but the damage was done. An attempt to make a version of the Ro80 with a more conventional engine (called the K70) but this was not very successful. Production of the Ro80 ended in 1977, but the Neckarsulm assembly plant moved to building Audi models which it still does today. The Ro80 was considered a disaster at the time, but the design and feature set were hugely influential, especially on Audi who incorporated many of the design themes that it set. The brilliant designer Claus Luthe worked for the VW/Audi group for a while and then moved to BMW where he created classic designs such as the E30 revision of the 3-series. Tragically he was convicted of killing his own son in 1990 and was jailed for manslaughter. He died in 2008. An all so typical comment regarding the engine. Actually one of the most dependable classics to own these days but sadly pub-talk still prevails in most cases .